I'm a striper guy who has ignored my local freshwater ponds for too long ... need to get back into it. Technically not a noobe as I fish quite a bit for stripers, and I grew up fishing every day at the local ponds for panfish, bass and pickeral until I was about 16 ... now I can barely register a hit when fishing freshwater. I have a bunch of tackle ... spinner baits, soft baits/worms, some jigs, a few stick baits. I have 2 setups ... a 7 foot Cherrywood/Cardinal Spinning Reel with 20# Braid, and a 6 foot med spinning rod with a Michell 300 Spinning rod and 8 # mono. I fish either from a kayak or from shore. what 4-6 baits should I have with me when I'm just learning about a body of water? how should I fish these baits? when do I change my baits and tactics? First off, @jeffreyrichard , welcome to the site! Your questions cover a lot of ground, so I will reply with some basic answers right now and then more detailed info later on, when I have a bit more time to go into depth. Regarding a new pond/lake, there are two things to do. 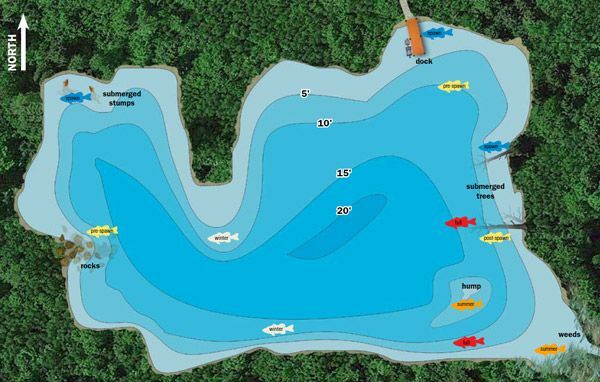 First, check out a map of the lake in advance, so you can get an idea of the lake's depth, contours, etc. Pick areas to try based on the season we're in. This time of year, you'd be looking for deeper areas that are close to shallow flats and coves, where the fish will gradually be moving up into as the water warms. Remember that the northwest areas will typically warm up first due to the exposure to the sun almost all day long. Once you have gathered info from the map, use that to check the lake once you've arrived and then let your eyes and your electronics (if you have any) tell you the rest. Maps won't tell the whole story. So using visual cues will fill you in on the rest. 1 - Spinnerbait to cover water. 5 - Plastic worm in 4 inch or 5 inch size. Most people will recommend a stick worm, such as a Senko style bait. I love topics like this because there is so much information out there and so many "rules" out there and even for people who do it all the time its great to list all all the tips and tricks just to bring you back to your foundation. We can probably keep this thing going through the year. As the year progresses your baits and presentations will change. I will start with general information and then go into what works this time of year. First off, bass hang around "stuff". Trees, grass, lily pads, reeds, rocks, docks, etc. You can learn so much by just going to bass pro shops and looking in their tank. Big open tank with 1 large rock and a log. 80-90% of the bass in that tank are hovered around that log up against that rock. Seldom are they just randomly swimming around for no reason. So whenever fishing new water try to find that "thing" that the bass are relating to. If you find that "thing" and there is a lot of it then look for the one or a spot where it is irregular or isolated away from the rest. Bass related to objects and changes. The idea is you can start by finding things that are visible to everyone. Electronics will help you find those things that aren't visible to everyone such as boulders, humps, drop offs, fallen trees, and other stuff under water. As for baits, Curt hit it pretty good. The only bait I would add would be a suspending jerkbait. That is a year round bait that by changing the cadence you can match the attitude of the fish. That and we have a fair share of clear water up here and they thrive in clear water. Using this bait you twitch the rod tip beginning and ending each twitch with slack in your line. Only use your reel to pick up slack, never use it to move the bait. Your rod does all the moving. The twitch can be a gentle tip of the rod to a hard snap depending on how you are trying to present the bait. In presenting a bait general rule of thumb is in colder water you want small, subtle, natural presentations. As water warms and fish get more active you can go big, loud, obnoxious until we get in the dead of summer where its at its hottest. At that point you either need to tone it down or focus your efforts in early morning and later afternoon/evening. When we get to the fall they get active again and into the winter where they shut down. In cold water a lipless and jerkbait are my go to. That jerkbait will take its toll on you. By early summer your forearms will look like PopEye's. In a week or two I will be on the water and the way I will work that jerkbait will be light twitches and long pauses. As the water warms I will pick up the speed and putting a little more "pop" into the twitch. By May/June I am just cracking that rod as hard and fast as I can. Here is a general map. I dont love it but I cant find one better. Right now I would say we are in a winter pattern. As we get later into April I would start to call it "pre-spawn".